The 35 metre motor yacht Iona G, listed for sale by Michael Newton-Woof at Ventura UK, is sold with Pierre Badin at Gaspard Yachts introducing the buyer. Built in GRP by Italian yard Riva to a design by Officina Italia Design, she was delivered in 2008 as one of the yard's Athena 115 series and accommodates 10 guests in five cabins consisting of a main deck master suite along with two VIP suites and two twin cabins below, all with en suite bathrooms. The elegance of this 35-metre yacht continues to capture the imagination of those who recognize Riva's craftsmanship when they see it. 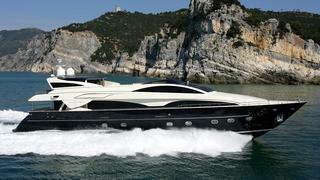 Iona G is an excellent example of this incredible, one owner from new motor yacht range. Her replacement cost today is currently €12,000,000. The saloon has the air of a gentleman’s club, with leather sofas and armchairs, coffee tables and an entertainment centre including a 43 inch plasma television screen. Another relaxation area is located in the large enclosed skylounge on her aft flybridge. Twin 2,775hp MTU engines yield a cruising speed of 24 knots and 28 knots at full throttle. Iona G was asking €4,950,000.